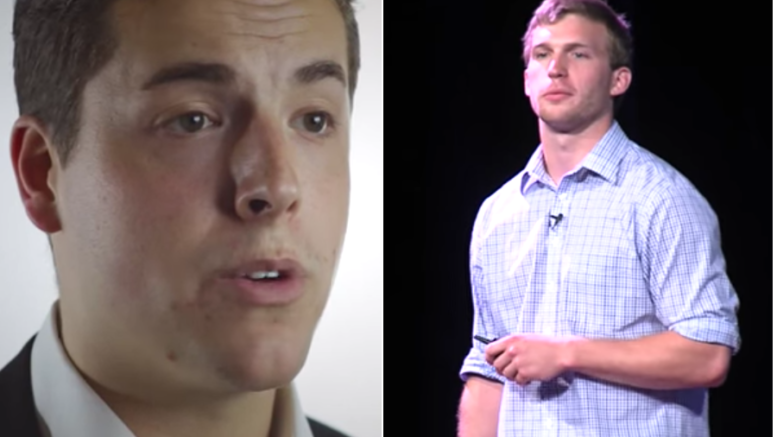 Robert Lauf in a political campaign ad (left) and Levi Bachmeier delivering a Ted Talk (right). North Dakota Gov. Doug Burgum has hired two youngsters from his campaign as “policy advisors,” though it’s unclear what wisdom they possess. Robert Lauf and Levi Bachmeier worked as “political director” and “director of advance operations,” respectively, on Burgum’s campaign. Now each will collect a $57,000 government salary. Both are former student body presidents (Lauf at North Dakota State University and Bachmeier at Concordia College) and have some fellowships and internships on their resumes. Lauf graduated in 2015 and Bachmeier in 2014. Lauf’s experience also includes an unsuccessful run for state house in downtown Fargo’s District 21, while Bachmeier did Teach For America. What Schmuck Would Spend $25,000 to Sit Next to Doug Burgum? 1 Comment on "Two of Burgum’s “Policy Advisors” Recently Finished College"
But one of them delivered a Ted Talk!!! That is sure to impress nobody!